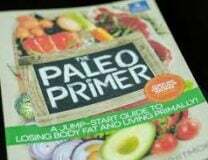 We have Paleo books for men’s issues, women’s issues, exercise and children. What’s missing? 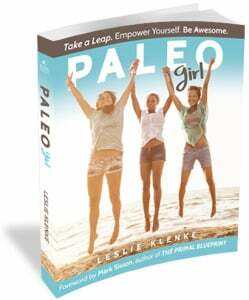 Leslie Klenke and her book for the paleo girl. 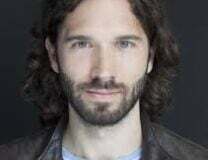 This podcast interview with Klenke delivers a straight-through look at the book. If you think your teen might not read this excellent book, offer them the podcast instead. (See the play link below or get it on iTunes). They’ll get the info they need either way. “Paleo Girl” has a chatty girl-talk style that’s easy to follow and doesn’t get preachy. The chapters are the right length, with enough pictures and graphics to keep a busy teen mind engaged. The book can be opened anywhere and the reader will get a complete offering wherever they land. Almost every page is sub-titled in color and delivers several concise paragraphs on the topic (in easy large print). I loved the set-up for this question, and Klenke’s answer…. “Because you won’t always be able to get away with this c**p!” She follows with a nice discussion on why weight gain is so common in college years and why we need to eat, move and live for health now. Are Diet and Exercise Included? All the basic Primal lifestyle guidelines are here, from sleeping in the dark to making time for play. But Klenke works them in so subtly you hardly realize the organization skills that fit it all in. The food of course is Paleo or Primal, but Klenke emphasizes here (and everywhere else) that perfection is not the goal. The food guidelines are helpful and well-summarized without being overwhelming. 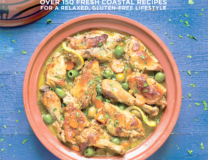 35 recipes that anyone can do are included. Nice pictures again too. Girl Hormones, and Boys Too! Chapters include how and why teen boys are different (and what causes them embarrassment), and a nice section on toxic body care products. Five easy do-it-yourself recipes for cleansers and moisturizers are included. One of the most useful chapters is titled “Puberty 101: The Down and Dirty”. In a mere 24 pages, Klenke covers boys, acne, raging hormones, the menstrual cup, body image and the identity crisis that comes with all the changes. If you’re a Dad with a teen girl, this chapter (and book) will change your relationship forever. Paleo Girl is a really helpful parenting tool! Buy the book on Klenke’s website, at Primal Blueprint Publishing or on Amazon. And don’t forget the podcast too….